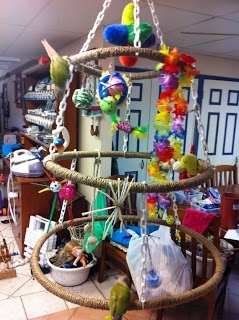 Use hula hoops to make a mobile for your birds! Find hula hoops of varying sizes and wrap sisal rope or string around each hula hoop. Connect the hula hoops with plastic chains and connect the top chains with a metal ring. Hang small toys or climbing ropes from the higher tiers of the mobile for your birds to enjoy and hang the mobile from a hook or plant hanger.